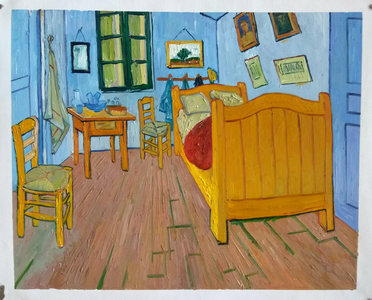 Van Gogh’s painting of his room in the Yellow House. On the walls his own paintings with just a bed, desk, and two chairs, but through his choice of complimentary colours the room comes alive. Van Gogh lived a nomadic existence during his 37 years of life. It is believed that during his short life he had lived in 37 separate residencies, across 24 different cities, often as a boarder or guest or staying with family and friends. This painting is the only time he ever painted his room, and shows his special connection with The Yellow House, in Arles, France. He felt estranged mostly from his family – except his supportive brother Theo - during his life and resolutely put all his energy into conquering his art, so he may communicate with the world. It’s no accident then at times he felt a great longing from where he had come from. 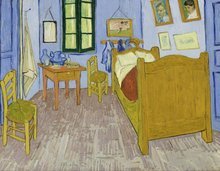 It is said that Van Gogh got the idea to paint his bedroom after being bedridden for days with a sickness. In the end he painted three versions of The Bedroom. After this version was damaged in a flood Theo sent it back to him so he could make a copy. This became the second version. And finally Van Gogh made a smaller third version as a present to his mother and sister, Wil. 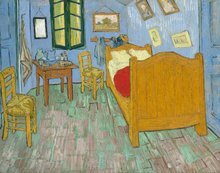 In 2016 the Art Institute Chicago, presented all three versions together in an exhibition titled, Van Gogh’s Bedrooms. 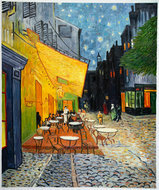 It focused on Van Gogh’s traveling life and his quest to find a home. Real beautification can be achieved when oil paintings are used for your home. When you purchase this oil painting you are not only beautifying your home or office; you are making a statement. This is awesome reproduction and we are very happy with it!